I came home tonight, and my husband had cooked this salmon. We’re always trying to eat more fish, but gosh it’s hard. I thought it was delicious, and my son even took a couple bites! Success!! A casual conversation prior to a cold front and the Super Bowl turns to food. No shocker here. Thankful for friends that always have the perfect recipes at the right time. Deidra has four children and is an amazing cook. She shared with me that her children are now very much an active part of the kitchen. I loved hearing stories that her three girls are such big helpers. This chowder is her latest favorite and couldn’t resist passing this on. Use a minimum 9 quart stock pot. Melt butter, add salt and pepper, and sauté onion, celery, and peppers over medium/high heat for about 10 minutes or until soft. Add shrimp and cook for 3-5 minutes or until pink. Add all canned ingredients and thawed crawfish tails and stir until a slow boil is reached (about 10 minutes max). Add sour cream, half & half, and crab boil. Bring to a boil and decrease heat to low and stir constantly for 30 minutes. Add Tony Chachere’s seasoning to taste and black pepper. Cover and let sit for 2 hours. Add crab meat and warm through again. I had this at Portland good friends, Iva-Marie and Kyle’s, and I had to learn to make it. They had had it at the restaurant Saucebox and asked for the recipe. (How much do we love it when our friends have the chutzpah to ask for the recipe?) Then somebody wrote into Bon Appetit asking for the recipe, and it is now very popular on Epicurious. And it’s my favorite way to serve salmon. If you have left over sauce, just drink it out of the pan, er, I mean use it with chicken. I once served this dish for a group who all started high fiving about it, which I took as a good sign. Our first blog photo - half eaten! Melt butter in heavy saucepan over medium heat. Add pepper flakes and garlic. Stir until garlic is fragrant. Add the brown sugar, and whisk to melt. Cook until bubbling on top, about 4 minutes. Add lime juice and soy sauce. Increase heat, bring to boil, and cook for 2 minutes until reduced to about 1 1/2 cups. Add cornstarch mixture and boil until thick, about 3 minutes. Set sauce aside. Preheat oven to 400. Melt 1 tablespoon butter in heavy large skillet over high heat. Cook salmon until golden brown, about 2 minutes per side. Put that pan into oven if oven proof, or transfer to baking sheet. Spoon 1 tablespoon sauce over each fillet. Roast until fish is opaque in center, about 5 minutes. Put some sauce on salmon as you grill it in foil. 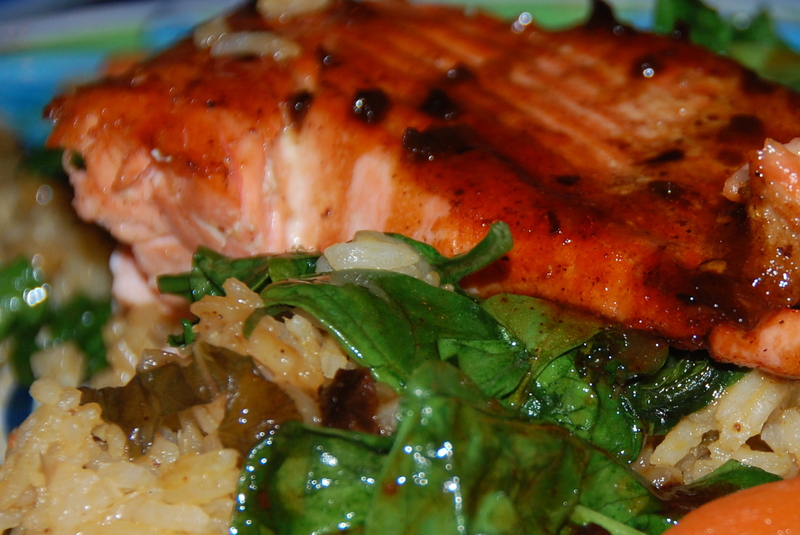 Serve the salmon over jasmine rice and sautéed spinach, then top with about ¼ cup of sauce (roughly) per person. If you want to get fancy, sprinkle steamed baby carrots all around the plate, drizzled with a bit of the sauce. Yet another option – Serve over wilted spinach. Melt 2 T. butter in pot over medium high. Add spinach and toss until wilted but still bright green. Season with salt and pepper. It’s especially fancy to serve rice, spinach, then salmon, sprinkle steamed baby carrots around, then drizzle sauce over all. My friend, Lisa discovered this recipe from Cooking Light, 2006. My family loves it. I buy the frozen bag of Tilapia at Wal-Mart. I double the crema recipe, as we like more sauce. We also make the crema ahead and add a little more lime juice than it calls for. The consistency should be the a little thinner than sour cream. You will spoon a tablespoon of crema on your corn tortilla, then add the cabbage and fish. You may also substitute peeled medium shrimp for the tilapia. To prepare crema, combine the first 8 ingredients in a small bowl; set aside. To prepare tacos, combine cumin and next 5 ingredients (through garlic powder) in a small bowl; sprinkle spice mixture evenly over both sides of fish. Place fish on a baking sheet coated with cooking spray. Bake at 425° for 9 minutes or until fish flakes easily when tested with a fork or until desired degree of doneness. Place fish in a bowl; break into pieces with a fork. Heat tortillas according to package directions. Divide fish evenly among tortillas; top each with 1/4 cup cabbage and 1 tablespoon crema. Kendra’s business partner Jeremy shared this yummy recipe. It is another great one for the grill. Skewer les shrimpies and sprinkle lightly with salt. Cook over medium heat on bbq until no longer translucent (don’t over cook!). Eat by themselves, or in soft taco shells with mango salsa!